With Node.js and MongoDB increasing in popularity, the MEAN (MongoDB, Express.js, Angular and Node.js) and MERN (MongoDB, Express.js, React and Node.js) stacks are essential tools for the modern developer. In the MEAN code pattern and the MERN code pattern we cover how to deploy a MEAN or MERN stack with IBM Cloud App Service, as well as native commands such as kubectl for Kubernetes and cf for Cloud Foundry. MERN is the same as the MEAN stack, but with React instead of Angular. More developers are interested in React because Facebook created and uses the library. Whether you decide to use Angular or React is completely up to you, what your company approves, and what your team is familiar with. The cloud native approach to development and deployment of applications is one that takes full advantage of the characteristics of the cloud computing environment. It’s a journey that not only requires changes to the processes and workflows, but also requires a modern cloud platform built with the technology and tools to support this new approach. Microservices architecture: Microservices, as an architecture, describes an approach to building complex applications out of smaller independent services. These services are single-purpose, with a small business capability scope. They communicate with other services using lightweight APIs and language-agnostic protocols. Microservices are built, operated, scaled, and evolved independently by teams that specialize in the business function that the microservice serves. Containerization: Containers technology offers a lightweight, highly portable virtualization solution. As compared to previous generation virtualization technology, containers are orders of magnitude faster to provision and are much more efficient in resource utilization. You don’t need containers to build microservices, but containers enable you to reliably port your application from your workstation to different cloud environments without any manual code intervention. Automating with DevOps: Teams work collaboratively using tools to automate the build, deployment, and management of apps. This approach reduces disjointed hand-offs and manual processes that can introduce human error and downtime. Agile transformation: Enterprise cloud transformation must evolve to a true multi-cloud, cloud-native development paradigm to enable market disruption. Being cloud native requires people, process, and technological transformation to be successful and truly take a sustainable leap forward. Starter kits make it easy to follow a cloud-native programming model that uses IBM’s best practices for app development. You get access to test cases, health check, and metrics in every starter kit. If you click on “Build from Starter kit” at the top of the code pattern, you’ll also be able to dynamically provision cloud services. Those services will automatically initialize in your generated application. Add a managed MongoDB service, a Watson service, or automatic tests in a customized DevOps pipeline. Starter kits get you up and running FAST. In just a few clicks, you are able to get a cloud-native web app running on different environments like Cloud Foundry or Kubernetes, the choice is yours. Starter kits ensure that no matter the technology stack you choose, you follow IBM’s best practices. 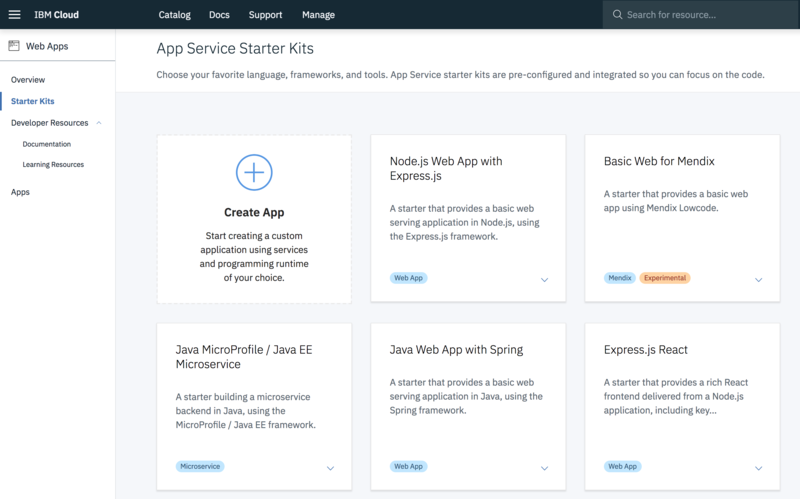 IBM Cloud has over 15 starter kits just for web apps. We cover MERN, MEAN, Python, Swift, and Java. In addition to web apps, IBM Cloud also provides starter kits for Apple mobile development, Watson, and finance. Check out the MEAN code pattern. Check out the MERN code pattern.